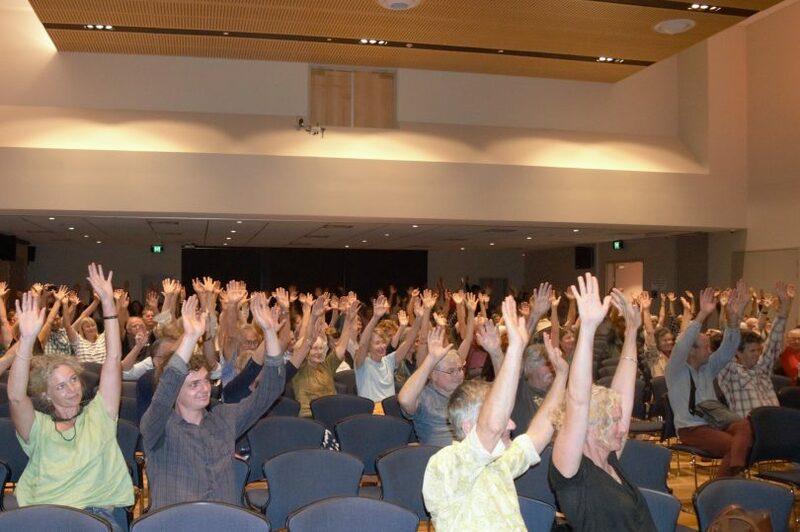 A two-handed show of support for a future of renewable energy at the civic centre in Bega on March 19. Picture: Elka Wood. 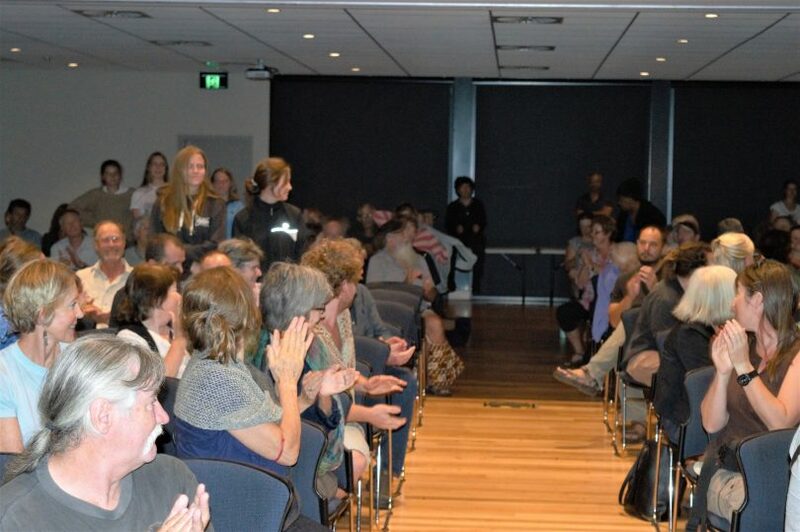 Between 350-400 people in Bega last night unanimously voted for 100% renewable energy for the Bega Valley by 2030. 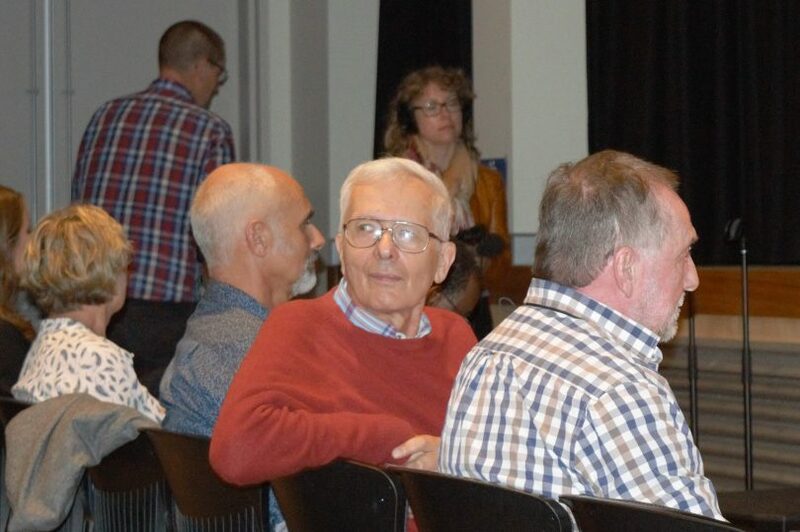 The vote, initiated by local climate change action group Clean Energy for Eternity (CEFE), follows a similarly unanimous vote and public meeting in Tathra on February 19. CEFE Founder, Dr Matthew Nott said that the results of both meetings will be taken to Bega Valley Shire Council which, incidentally, is currently reviewing its clean energy policy. “We’ll take your vote to the council and say ‘this is what this meeting thinks your target should be,'” Dr Nott said. Attendees heard from Annalise Piotrowski, a year 11 student at Lumen Christi Catholic College, Mark Diesendorf, Associate Professor at UNSW Sydney, Derek Van Bracht, Environmental Services Coordinator at Bega Valley Shire Council, Nick Graham-Higgs and Brooke Marshall of NGH Environmental in Bega, Elvis Amair, a chemical engineer who has worked on environmental solutions for Bega Cheese and Don McPhee, a concerned citizen with a background in land management. Ian Campbell of About Regional was asked to propose the two motions that were voted on. Associate professor at UNSW Sydney, Mark Diesendorf [in red] said that the main barriers to achieving 100% renewable are now political and cultural, not practical. Picture: Elka Wood. Local government is leading the way in switching to renewable energy, Derek Van Bracht said in his address, pointing to 11 other councils including Eurobodalla Shire Council, who have already adopted a 100% by 2030 goal or similar. Bega-based environmental consultancy, NGH Environmental now employs 68 permanent staff, proving that “renewables have a huge potential to help with economic growth in our area,” founder Nick Graham-Higgs said. 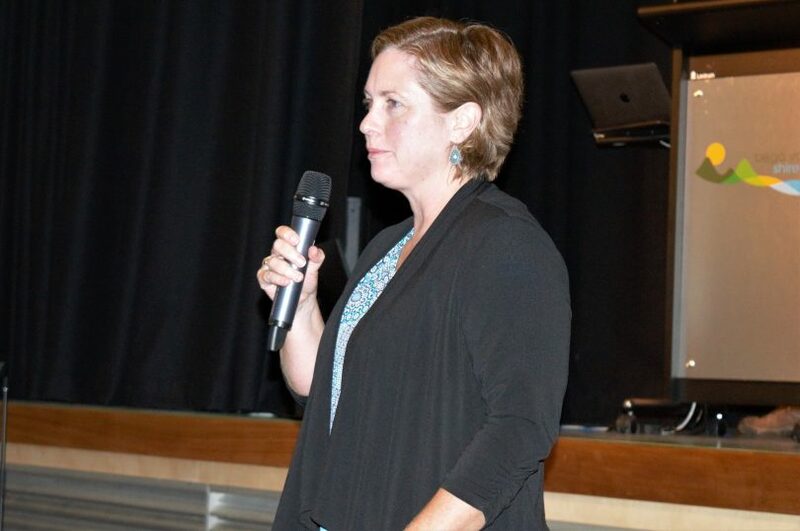 Brooke Marshall, of NGH Environmental, spoke about the potential for renewable energy in the Bega Valley. Picture: Elka Wood. Brooke Marshall of NGH Environmental spoke about the success of the Boco Rock wind farm near Nimmitabel as a regional example of large scale renewable energy production. “There’s not a lot of scope for wind farms around the Bega Valley but there is lots of potential for large scale solar farms,” she said. Ms Marshall also spoke about the rapidly growing and developing field of lithium-ion batteries, which have historically been the most expensive part of any solar system. Many of the speakers agreed that a lot hinges on bringing the price of batteries down. “It’s happening, China has factories making batteries now and that will bring the price down – not in one year, perhaps, but over several years,” Prof Diesendorf said in response to a question about dairy farmers struggling to pay power bills and replace old, inefficient refrigerators. The line up of speakers at the meeting, left to right: Brooke Marshall, Don McPhee, Prof Mark Diesendorf, Nick Grahm-Higgs, Elvis Amair, Annalise Piotrowski and Derek Van Bracht. Picture: Elka Wood. Solar is not the only option for energy production in the Bega Valley. Elvis Amair, a Bega-based chemical engineer said. Mr Amair has recently been involved with setting up anaerobic digesters in northeastern Victoria, which capture gases from organic waste and create power. Amair, who has worked on environmental solutions for Bega Cheese, sees a potential for such systems in regional areas. Students who were part of the March 15 Climate Action Rally received a round of applause at the meeting. Picture: Elka Wood. Climate change and the future of renewable energy will again be at the forefront of the upcoming NSW Election this Saturday and the Federal Election sometime in May, with many asking for bipartisan support on the issue. Dr Nott says that while he doesn’t know how close the entire shire is to meeting Clean Energy For Eternity’s 2006 goal, 50/50 by 2020, he can say that Tathra is about a third of the way to being powered 100% by renewable energy. “I tell you what though, we are going to smash the 100% by 2030 target for the entire Bega Valley,” Dr Nott says cheerfully while packing up after the meeting. About Regional with another bit of creative journalism. Why are you still stretching the numbers? Are you trying to set an argument that there were more 'voters' for your cause than there actually were when you bring this to council? 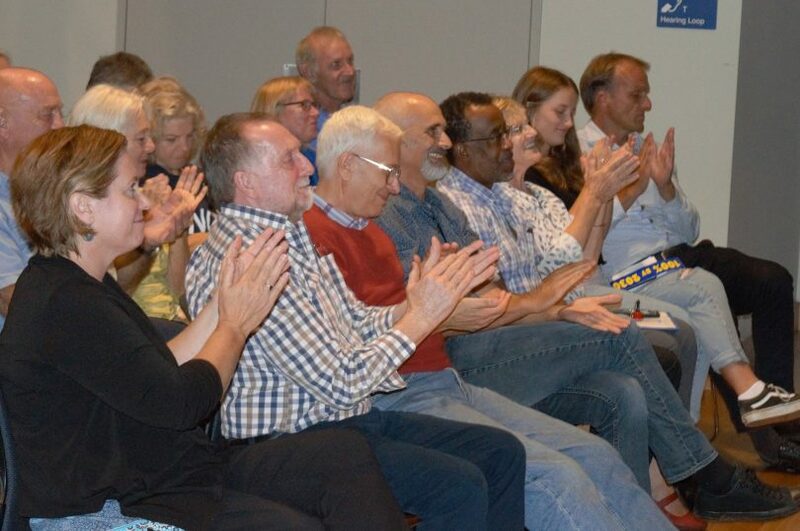 Just as you cannot claim 'Tathra voted unanimously' unless you can provide the evidence of the other 95% voting and with this meeting, which was attended mostly by the supporters of CEFE you have again inflated the numbers though not as bad. Maybe you had 350 people at one point but at the time you held your vote, there was considerably less. When I look at the short video I took, it is a stretch to say more than 150 were there. Asking people to hold up 2 hands does not change that either. Hi Deb, not sure I follow all of what you are saying but we stand by our report of the Bega and Tathra meetings. Ian Campbell. Just want to say thank you to Dr Matthew Nott for his commitment and inspiration which has brought the community to this point. Matthew has stayed with this project inspiring so many assisted by a great team of hard working intelligent local people and we owe him and his team our immense support and thanks. I recall how Matthew told us that he'd been on life saving duty at Tathra on a particularly hot day while also at that time reading Tim Flannery's book regarding climate change. His resolve and determination to raise awareness of this important issue and the need for us to focus on renewable energy to cut down on carbon has brought us to this inspiring point and to Matthew we all must say a massive thank you. We must not stop here though - we all must make a determined commitment to 100% renewables to bring this about. Great to see Bega Valley being a leader in community driven renewables and ready to seize the opportunities that come with them.